GrabPoints Review: Is GrabPoints Legit, Or Super Lame? Last updated on April 3, 2019 By Nat Leave a Comment This post may contain affiliate links. We appreciate you supporting Rags To Niches! Full disclosure here. Is GrabPoints Legit, Or Just A GPT Scam? GrabPoints is another GPT site, or get-paid-to. Where you can earn points for completing certain tasks; such as signing up for certain offers, completing surveys and downloading apps. I review a lot of these kinds of opportunities and generally, I do prefer sites where there are more than just paid surveys. But the question is, if Grabpoints worth your time, is it legit and can you make money here. Stick with me in my in-depth GrabPoints review and I will try and answer that for you! Cost: Free – $5 bonus sign up here. Money making opportunity: Pocket money. Looking For Surveys? Try These 10! When you first join GrabPoints, you’ll be asked a series of profile questions prior to joining. This is just things like, your age, how many kids you have and your occupation. After you’ve completed that, you’ll be taken to the main dashboard where all of the opportunities to earn are. Promoting Grab Points to others online – such as by creating a YouTube video. There are some mixed reviews online regarding GrabPoints, so I wanted to check it out myself and give my own opinion of it. What do you make of Grab Points? Do you have a different favourite? Let me know in the comments! Useful Post: 40+ ways to make cash online. 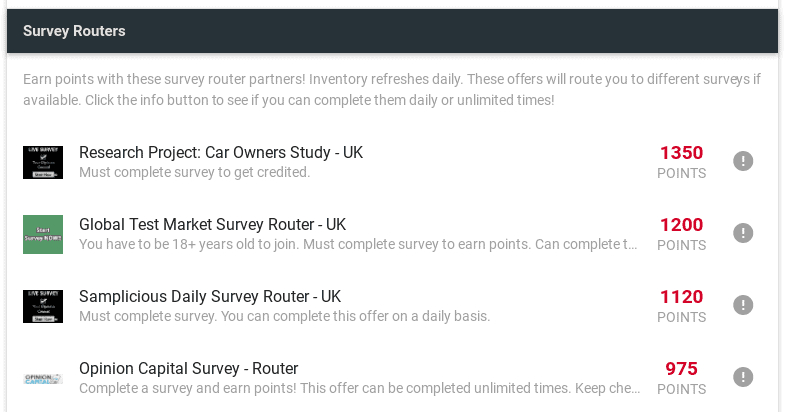 As I’ve realised after joining many similar sites to this, they will connect you to various survey providers that will link you out to many external survey sites on the web. So, if you’re hoping to just sign up to a survey site and complete surveys right there on the platform, that’s not what happens in these cases. Generally, you will be linked to these external providers where you have to answer the same old questions again and again every time, (your age/occupation/salary/how many children you have etc…). That being said, it can also give you a bigger opportunity to earn from surveys in some ways, (if you don’t get disqualified) because there are so many different providers available & therefore, a never ending amount of surveys. The problem is, you can spend so long just trying to find one that allows you to complete a survey, without chucking you off. 1. You will often not qualify for MORE surveys than you do qualify for. It’s common for me to have to go through 5… 6… even 7 surveys prior to getting qualified for a single one and I am not alone in this. This is because companies are generally looking for a narrow demographic. and it’s more unlikely than likely that you fit into it. 2. Most people feel that, for the hassle it takes to complete them, you simply do not get paid enough. 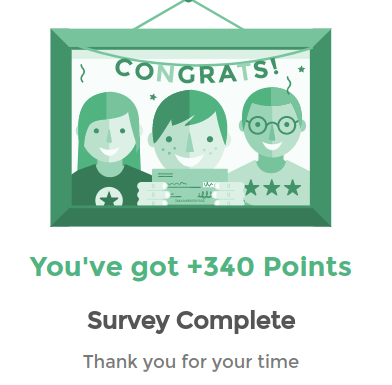 I do an experiment over at GrabPoints, to see how many times I get disqualified prior to getting accepted on to a survey. You can check this by scrolling down – it was a surprise for me in this case. This is where you will be redirected to an external site and can earn a points reward for completing a survey via there. Sometimes they also will send you to offers, that you have the option to partake in. I went to an option with SaySo rewards. They redirected me to Unique Rewards, which I have already signed up to previously, so I could not get paid for that. I clicked another offer – but that involved purchasing clothing. I clicked on another offer and it told me no more offers were available. You do have to manage to actually complete a survey in order to be credited though, (which is where you may run into a problem). To get paid for via their offers section, there is a large list of their different partners. Each partner will have a different range of offers, (some will also share the same offers). Some of these partners actually don’t just have paid offers, they also have things like paid surveys and pay-to-watch videos as well. Many of these companies I had already seen multiple times before via other websites. However, had not seen “reverse universe,” before – so, I decided to check that one out. I was actually supirsed to see some offers that I hadn’t seen before. Including a survey from Red Bull and some food/cooking related trial offers, that could interest me personally. Although, I realised not everything was quite as it seemed. I opted for the Red Bull survey, that said it would only take 2 minutes for 125 points. I was sent to One Opinion to register!! There was no Red Bull survey there at all. Something else I found funny was that one of the offers was to join Grab Points for 3000 points…. An offer to join Grab Points while you’re already on and REGISTERED at Grab Points!?! Clearly, you’re not going to get anything if you’ve already signed up. I guess they just use the same offer wall, whatever platform they’re on. There are a lot of offers to sign up with different survey companies, which you may well have already done. There are also lot’s of Casino type offers – which again, you may have already done if you’d made money with matched Betting. You can also earn points by downloading Apps – but often these offers are still bundled up with others, so you have to have a look through. Also, although you may get paid points for downloading the App – there are often extra conditions. For example; you may have to play and reach a certain level of the game before you can earn your points. As with a majority of these sites, you can sometimes earn via watching videos too. Although, the pay for this is so minimal that you really shouldn’t make an effort to do this, in my opinion. For example; you may only get 10 points for the video and you need thousands of points to redeem anything. So, there are a selection of offers available, (but whether you actually get what is advertised may be something else) – but I wanted to see how easy it is to complete a survey here. They’re one of the popular ways people try and make money online, as they’re free and you don’t have to provide your credit card info, or risk being charged, (as you can with some offers). The issue is, getting accepted on to one. So, how long did it take me? Let’s find out. I went to pollfish first, which said I could earn points for quick 1-3 minute surveys. I was screened out after one minute. What I noticed though, is when you go to the survey section, they have a bunch of companies there to choose from and they have other things aside from surveys to fill in. Such as, I was offered the chance to fulfil a survey to review and keep a Dyson. There were also offers – for example; one would have rewarded me points for filling in my info on a loan website, (well… that would lead to spam, so I didn’t do it). Still, it’s all a bit bundled together. I think if you want to do JUST surveys… that’s all you should see in the survey section, right? Anyway, next I went to Peanut Labs… because, as far as surveys go, I seem to have had the best luck overall going through them. Whenever you join a site and go through them, you have to answer a bunch of profile questions first that takes a couple of minutes. whenever you get to peanut labs, it shows you a grid like above – telling you what surveys are available, how many points you can gain from taking it and how long they take. I am dubious this grid has any bearing on reality though. Whenever I click through, what is advertised isn’t there and I will be shipped off to some other survey. In any case, I obviously decided to go for the quickest one possible, that said it would take six minutes. I’m doubtful I will actually get it. I clicked the link and it did take me to a survey that took me around 5 minutes to complete in reality and definitely was related to some of the profile questions I’d answered before. So, this was quite impressive, I’d actually qualified for the second survey I went for. I’d definitely recommend going to peanut labs, because I seem to have had the best experience qualifying for surveys via them. Well, but this time I’d answered a bunch of points for answering profiling questions, connecting to Facebook and completing one survey. I had 540 points. But how much do you need to withdraw anything? Well, if you’d like to exchange your points for an amazon voucher, you’d need 15500 to redeem a £10 amazon voucher – this would be slightly different in the US. Nevertheless… I’d need nearly 15,000 more points! Or, in another way, I’d have to complete around 40 or so surveys like the one I just got accepted on to. In any case, it’s going to take a pretty long time. There isn’t just Amazon available though, but a wide variety of rewards – as well as Paypal, Skrill, Google play and various games subsriptions. It’s worth mentioning that they do have an App to download. This can make entering surveys and so on far more convenient, as they’re something you could do while travelling or just watching TV. A shout-out section to the right, where you can see what other people are earning and this can give you some ideas of what to try next. I find the whole layout pretty confusing. You go to something labelled “download apps,” and you expect that is ALL that’s in that section, but that’s not the case. There will be various things jumbled up. You need a lot of points to cashout anything, but that’s pretty standard. Grabpoints Review Conclusion – is GrabPoints Legit? Grabpoints is not a scam – sometimes people may it is, because they may have trouble actually making points and qualifying for surveys. It’s a way of making a small amount of money on the side and there are a variety of ways to do it. You can make more money if you go for some of the bigger offers, but these will involve signing up to something with your credit card and often making a payment towards something. If you’re looking to make a part-time, or even a full time income online, then reward sites aren’t a realistic way to go about it. Even if you spent hours and hours on these sites every day, you would b e lucky to make a couple of hundred dollars a month. If you put some effort into it and spend some time each day on these sorts of platforms, it’s more realistic that you could make $50-$100 or so a month. a majority of people are lucky to cash out that much in a year however, as they’re just not very interesting to stick with long term and can become so repetitive. It’s easy to lost interest when the reward is so low. If you’re interested in making more of a long term income online – I don’t blame you. That’s what I came online looking for as well! Now I try and focus on building some different income streams. I make the most online right now is from running my own website, writing about things that interest me and earning via affiliate marketing and paid advertising. I had no knowledge about any of this when I started several years back. If you’d like to know how all that works, this is where I got started – you can see what it’s all about, for free. What’s your experience been like over at GrabPoints? Please leave me a comment below!